Products are now linked to your Google Account. So you can interact with them using your voice, via Google Home, or the Google Assistant on your Android / Apple smartphone or tablet. Once the pairing is complete, all you have to do is speak to your Voice Assistant for the products to react. To do this, always start your sentence with "Ok Google" otherwise the requests will not be taken into account. "Ok Google, turn off the room thermostat 1" / "Ok Google, turn off the kitchen"
"Ok Google, turn on the room thermostat 1" / "Ok Google, turn on the kitchen"
"Ok Google, what is the temperature of the bathroom?" 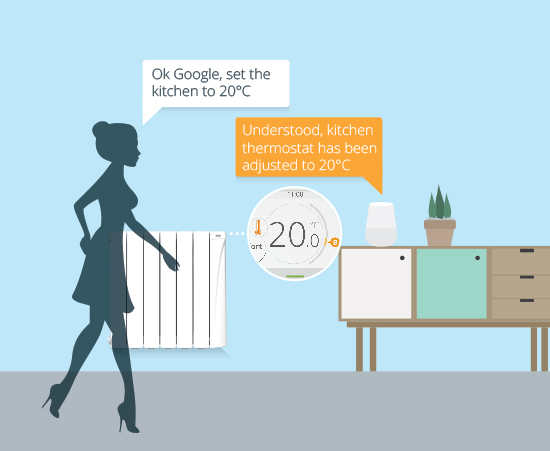 "Ok Google, put the office to Eco mode"
"Ok Google, put the bathroom to Boost mode"
"Ok Google, increase the temperature of David’s room by 2 degrees"
"Ok Google, lower the living room temperature by 5 degrees"
"Ok Google, put the room thermostat at 20 degrees"
*Non-exhaustive list: it can vary and be completed according to the evolution of the understanding of the voice assistant. The stated sentences depend on the understanding of the Google assistant.